A former Great Britain triathlete is helping give local children with disabilities the opportunity to take part in the event she loves. Jo Shallcross, from Ponteland, was inspired to organise a triathlon tailored to the individual needs of North East children after seeing a disabled child enjoying the event in Hawaii. With the help of her friend, Tracey Sample from Amble, The Children’s Disability Triathlon in Newcastle, sponsored by SOS Group, is now in its fifth year and growing in popularity. It is designed especially for children with disabilities who would normally be challenged by the thought of doing the event and gives them the chance to take part in a traditional triathlon – swimming, cycling and running – by adapting distances according to ability and with all the support they need. Jo, a coach and director of fitness business, The Barn, now mainly races Ironman or 70.3 (half Ironman), and explains why the event is so important to her. Jo says: “It’s really special seeing the children come back year after year and you get the biggest hugs when they come in. They’re just so happy to be back again. It’s like a highlight of their year and I know it is for me and Tracey. We just love it and it’s so, so worth doing. 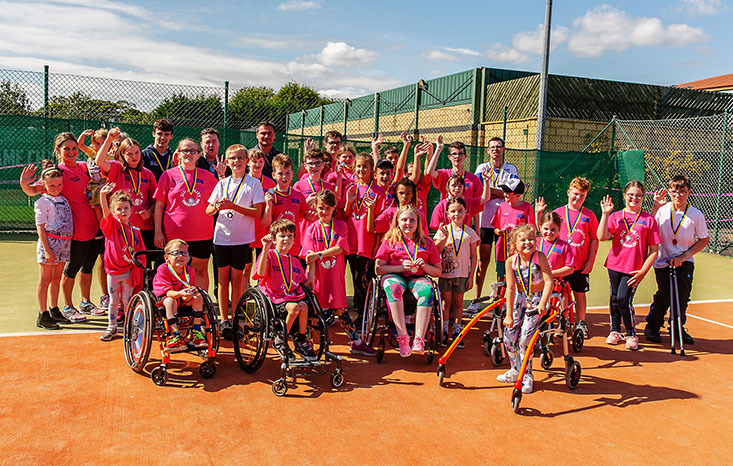 The Children’s Disability Triathlon is sponsored by Team Valley-based copy, print and scan management company, SOS Group, and they were thrilled to provide medals and t-shirts for all participants, as well as a video of the day to treasure. This year, there were 35 participants and the youngest was aged just six. There was also a small group of young adults involved, who were trying the triathlon for the first time. Santiago Candal (age 12 from Gosforth) successfully completed all three events and was supported by his enthusiastic family. Dad, Jaime Candal, says: “It’s the second time Santiago has taken part. He loved it last year but found the bike ride very difficult. This year he rode really well so we’re all very proud of him and pleased about that. “He goes swimming once a week at Northumbria University and does a range of activities through Percy Hedley but this is the only time he gets to do a triathlon. This is his annual event to prove his fitness! Newcastle swimmer and European gold medal winner, Nick Pyle, and former Newcastle United goalkeeper, Steve Harper, helped present the medals at the end of the triathlon. Steve says: “This is such great day. I came a couple of years ago and it’s brilliant to give these kids the opportunity to swim, ride and run no matter what their ability. The Children’s Disability Triathlon sponsors, SOS Group, have a longstanding tradition of local charity support. They are the headline sponsor for fundraiser Mark ‘Run Geordie Run’ Allison and long-time supporters of Special Olympics Gateshead, Tyne and Wear. Andrew Skelton, director at SOS Group, says: “We are so proud to support this wonderful event.